Do you enjoy using your mobile device everywhere you go? 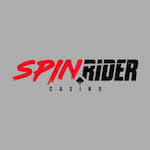 Then become an active member of Spin Ride Casino, an online gambling platform that is mobile-friendly, comes with exciting promotions and a large number of games that will truly entertain you. If you create an account and make a deposit over £20 you can grab an incredible deal of 100% up to £300 and 50 extra rounds on your favourite NetEnt slots. Use any deposit option except for Skrill and Neteller, as they do not qualify for this deal. Keep in mind that this mobile offer comes with 35 times wagering requirement that applies to the bonus credited and deposit amount. Respect it in order to make any withdrawal possible. More than that, the maximum cash out for the extra rounds is set at £100. This is the moment you've been waiting for - are you up for the challenge? Then gear up and boost your deposit at Spin Rider Casino!